Framed size 26″ x 26″ This is a version of the back cover of the Peter Max coffee table book. The book is included with the purchase of the painting. 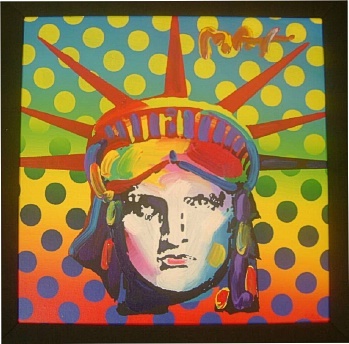 During a show the seller asked Peter Max which work he would rercommend for a first purchase. Peter suggested the Liberty Head since this is his “signature” image.